Pictured above is our magnum opus #3, St. Peter’s Catholic Church, Montgomery, Alabama. The original instrument was built in 1891 by the George Kilgen Company of St. Louis, MO., as a tracker instrument consisting of 28 ranks over 3 manuals and pedal. The instrument served well until about the mid 40’s. At that time the decision was made to replace the mechanical key action with electro-pneumatic pull down action. Concurrently, the tracker console was replaced with an electro-pneumatically operated console from the Pilcher Company. The instrument remained in service until the mid 60’s at which time the leather in the action began to fail. During the 1960’s a period of flight from the mid city to the suburbs ensued. The result was diminishing attendance of all denominations and hence, less income to operate the church which resulted in neglect to the organ. It remained unplayable from that time. 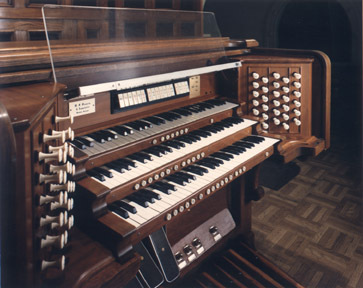 In 1990, we received a commission to restore the instrument. A devastating fire in our shop approximately six months later destroyed all but the facade pipes, casework, pedal Bourdon and pedal wood Open Diapason which remained on site for restoration. 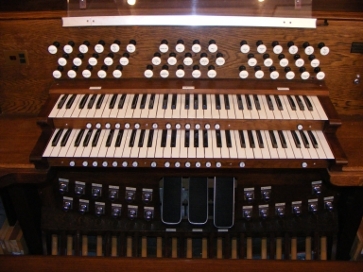 Pursuant to the fire our firm located an instrument that met our criteria from which we could engineer a new organ. We approached the restoration of the first instrument per our policy of retaining the original voicing, scales and artistic qualities of the Kilgen Company. However, having lost the instrument to fire, we now had the option of providing a replacement instrument representative of a more “American Classic” approach to voicing while still retaining some Romantic qualities. The 39 rank, 3 manual and pedal instrument pictured here represents the result of collaboration between our firm and John A. Farmer, Organbuilder of Winston-Salem, N.C. whose firm restored the facade pipes. 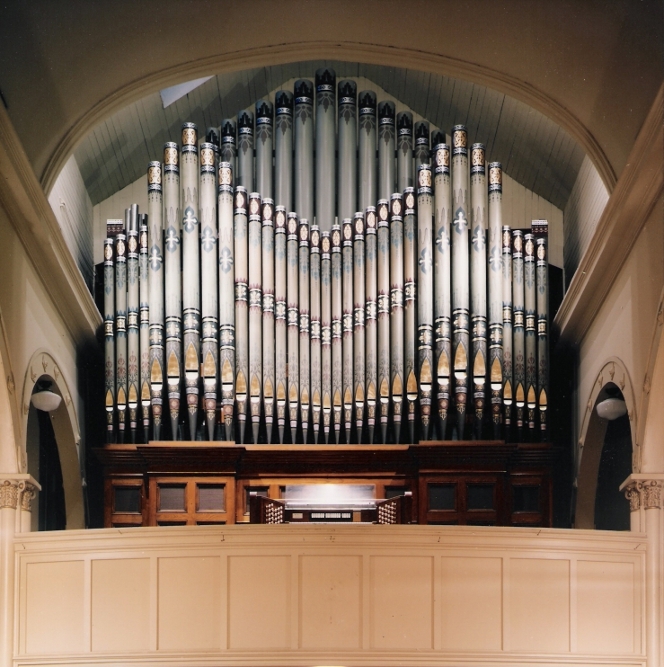 The organ was dedicated in January, 1991, 100 years after the original installation was finished. As is the case with many instruments over time, tastes, opinions and perceptions change. Organists and ministers of music sometimes have a free hand in altering the original concept of the builder. Our instrument did not escape these changes. Since 2009, another builder installed a new three manual and pedal console (along with digital voices) replacing the extant Moller console we provided with the instrument. The stoplist as presented here (see link to stoplist) was correct as of 2009.